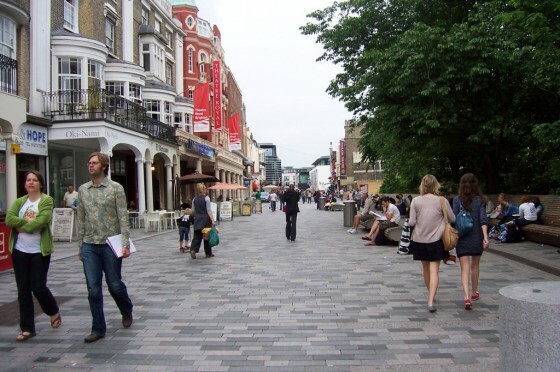 Walkable is good for business. A November 2013 report, Business Performance in Walkable Shopping Areas by the Robert Wood Johnson Foundation states that there are indeed significant economic benefits to businesses in walkable communities. 2. Businesses appear to do better in walkable commercial areas than in areas attracting mainly drive-to patronage. Rents in walkable shopping areas can be 27-54% higher than in non-walkable areas. Many of the most successful recent shopping developments today are located in walkable areas. 3. Accumulated loyalty and equity in businesses in a specific area produce a strong attachment. Retail establishments have high turnover rates, so maintaining a stable core of businesses is critical. This allows the turnover that does occur to reflect changing demographics and creating new reasons for shopping in an area. 4. Walkable shopping areas increase home values in surrounding areas. Each point increase in Walk Score correlates to a $500 to $3000 increase in home value. 5. There is great enthusiasm for walkable shopping areas among both the supply: Retail experts, developers, city leaders, and demand: Residents of urban and suburban areas. The evidence? Demographics (fewer couples-with-kids households), psychographics (growing demand for urban living), increased gas prices, public policies that encourage higher densities. 6. Ethnic and urban lifestyle areas value local shopping districts. Some of the most successful walkable shopping areas have become the ethnic social and retail centers of their communities, followed by those catering to new young urban lifestyles. 7. Walkable retail areas need to cater to diverse needs and reach a critical mass. In other words, retail areas need to accommodate multiple trips in one, from unique services offered by local shops to the more everyday needs offered by larger-format outlets and services. 8. Supermarkets are important anchors for walkable neighborhood shopping areas. Many successful local shopping areas today are built around highly attractive supermarkets, especially in underserved communities.